The Women Endowing Education Group provided the Blue Springs School District with a grant to create the W.E.E. 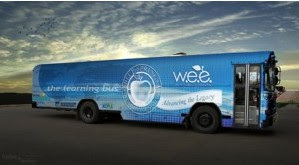 Learning Bus, the first of its kind of Missouri, said Katherine Barton, executive director of the Blue Springs Education Foundation. She said the idea came from an administrator who heard about a similar mobile technology lab in Brownsville, Texas. 1 Mobility. The learning bus is a 76-passenger school bus being transformed into a mobile computer lab. Barton said it will roll into the neighborhoods of the Blue Springs School District four nights each week beginning in August. Hollis-Miller Architects, as well as the Blue Springs School District’s Transportation Department, are working to transform the bus. David Kapuler at cyber-kap.blogspot.com writes, "The wave of the future is here, especially for education. Terms like 21st Century Computing, BYOD (Bring Your Own Device), and Cloud Computing are mainstream. The introduction of mobile devices, iPods, netbooks, and more specifically, the iPad, has brought technology to more students than ever before. A one-to-one computing environment is not only a possibility, but also a reality in more school districts than people realize. With all that being said, below are my 10 favorite sites for finding educational apps. 1. APPitic - Great site with over 1300 reviews done by Apple Distinguished Educators. 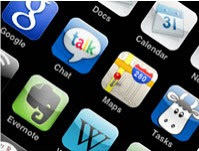 These apps have been tested in different grade levels with different instructional strategies. Don’t miss this opportunity to hear the latest research on the impact of blended learning! Instructors and students alike may shy away from online learning because they perceive it as distant or impersonal. However, a recent study revealed interesting results when instructors created additional learning opportunities using screencasts. Can utilizing online tools actually offer students a more personal learning experience? 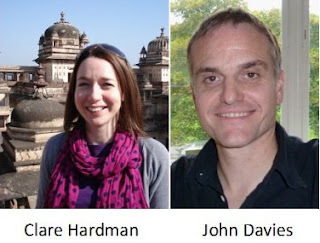 Join us for an interactive webinar spotlighting the results of the aptly named research project, ME2U, conducted by Dr. John Davies and Miss Clare Hardman of the Teaching and Learning Development Unit at the University of Sussex. Register here for the online event. Just look at this interesting line-up in this EDUCAUSE Review below. ﻿Diana G. Oblinger writes, "This issue of EDUCAUSE Review focuses on leadership and celebrates leaders in the higher education IT community. Leadership can exist at all levels of an institution or organization. It does not come from a job title, nor is it self-appointed. We must take the best from our traditions and our experience so that we can adapt to constantly changing circumstances. Leadership is about more than power or authority. It is about values, experience, analysis, and the discipline to change what we need to change. As Collins notes: "We cannot predict the future. But we can create it."" A university president who was also his institution's vice president for information technology and CIO for ten years answers the questions: "What do you now think about technology? From your point of view as a president, what are the major issues in information technology today? What has changed in your thinking?" Six CIOs and senior technology leaders talk about their backgrounds, the strengths and skills needed for future CIOs, and the challenges of preparing the next generation of CIOs. They list the most critical competencies for current and future CIOs, and they debate whether these competencies are changing. The winner of the inaugural EDUCAUSE Rising Star Award talks about becoming a leader and developing future leaders in the IT professional community. He outlines three steps that aspiring leaders can take to cultivate their leadership skills and three steps that residing leaders can take to leave a lasting legacy. Harvard Business Publishing and Hilton Worldwide today announced a multi-year agreement to provide Hilton Worldwide University, the company’s global learning resource platform, with leadership content and online learning programs. Harvard Business Publishing will offer a number of programs including Harvard ManageMentor®, the most trusted online resource for management essentials, as part of Hilton Worldwide University’s Leadership College curriculum. Hilton Worldwide University gives the company’s Team Members access to online and instructor-led workshops to build their job competence and professional development. Leaders will be able to access Harvard ManageMentor online and through mobile devices, supporting quick and effective learning within their fast-paced workdays. Harvard Business Publishing Corporate Learning partners with clients to create leadership development solutions for managers at all levels. Our team leverages the management insight, thought leadership, and expertise of Harvard Business School faculty and authors from Harvard Business Review to create tailored leadership development solutions. With more than 20 years of practical experience, our innovative, technology-enabled solutions drive meaningful and lasting business results. 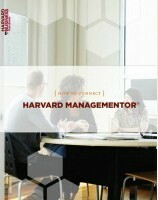 Corporate Learning is a market group within Harvard Business Publishing. For more information, visit www.harvardbusiness.org/corporate. Hilton Worldwide is the leading global hospitality company, spanning the lodging sector from luxurious full-service hotels and resorts to extended-stay suites and mid-priced hotels. For 93 years, Hilton Worldwide has offered business and leisure travelers the finest in accommodations, service, amenities and value. The company is dedicated to continuing its tradition of providing exceptional guest experiences across its global brands. Its brands are comprised of more than 3,800 hotels and timeshare properties, with 630,000 rooms in 88 countries and include Waldorf Astoria Hotels & Resorts, Conrad Hotels & Resorts, Hilton Hotels & Resorts, DoubleTree by Hilton, Embassy Suites Hotels, Hilton Garden Inn, Hampton Hotels, Homewood Suites by Hilton, Home2 Suites by Hilton and Hilton Grand Vacations. The company also manages the world-class guest reward program Hilton HHonors®. Visit www.hiltonworldwide.com for more information and connect with Hilton Worldwide at www.facebook.com/hiltonworldwide, www.twitter.com/hiltonworldwide, www.youtube.com/hiltonworldwide, www.flickr.com/hiltonworldwide and www.linkedin.com/company/hilton-worldwide. Aakash, the world cheapest tablet, will be available to students in the state for only Rs 1,500. Originally priced at Rs 2,500, the state government has offered a subsidy of Rs 1,000 for students to facilitate e-learning. The discounted tablets will initially be offered to students in state universities, engineering and polytechnic colleges and the government plans to extend the scheme to all private colleges in the future. The proposal has been sent to the Union HRD ministry which is monitoring the Aakash project. The tablets were launched by Union minister for HRD Kapil Sibal in October 2011. Designed especially for students with an aim of bridging the “digital divide” between the rich and the poor, the Centre aims to provide the tablets to 22 crore students over the next five years. Aakash (tablet). From Wikipedia, the free encyclopedia. How technology can reinvent how and where children learn. Kate Lunau writes, "At Eden High School in St. Catharines, Ont., students are banned from using their cellphones in the hallways. In Eric Moccio’s classroom, it’s a different story. Moccio, who teaches music and media arts, employs his students’ phones as a teaching tool: he recently had them vote via text message on the topic of an upcoming video project." Despite the technology-rich environment that surrounds kids outside school walls, most classrooms are lagging. Administrators worry that the use of phones, iPods and tablets could cause distractions, promote the rise of cyberbullying and other bad behaviour, and maybe erode literacy skills, fretting that students might start including textisms like “CUL8R” in their essays. While some school boards have resorted to bans on some technologies, not all educators agree that’s a good idea. In September, the Toronto District School Board, Canada’s largest, reversed a rule that personal devices should be turned off and out of sight within its schools, after trustees recognized that smartphones and other devices might actually enhance student learning. Now, teachers like Moccio are experimenting with new ways to use not only smartphones but tablet computers and interactive whiteboards. Indeed, proponents say that, at its best, technology can change virtually any place into a classroom—or transform a classroom into somewhere as remote and different as a Borneo rainforest. Phones make ideal teaching tools because, unlike laptops or spiral notebooks, students are unlikely to forget them at home. “They have quite a strong emotional attachment to these devices,” says Patricia Wallace, author of The Psychology of the Internet and senior director of information technology at the Johns Hopkins University Center for Talented Youth. Mobile phones are portable, especially for elementary school kids, who can’t lug a heavy computer in their backpack. And because they’re easy to carry everywhere, they can be used to take advantage of what she calls “micro time slots,” those spare moments waiting for the bus or a friend, when a teen could complete a quick lesson instead of a game of Angry Birds. Dennis Pierce, Editor writes, "In our "Site of the Week,” Dell is accepting applications for the 2012 Dell Social Innovation Challenge, a program that gives students from around the world the chance to bring their entrepreneurial ideas to life to solve some of the world's most pressing challenges." 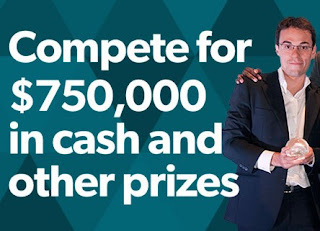 Dell is now accepting applications for the 2012 Dell Social Innovation Challenge, a program that gives students from around the world the chance to bring their entrepreneurial ideas to life to solve some of the world’s most challenging issues. For the sixth consecutive year, Dell is partnering with the University of Texas at Austin’s RGK Center for Philanthropy and Community Service to help fuel the entrepreneurial spirit of the best and brightest minds through this program. During the past six years, more than 3,000 inspiring social innovation projects stemming from 90 countries have been submitted through the Dell Social Innovation Challenge, which provides mentoring, tools, and more than $350,000 in cash prizes to teams of student entrepreneurs from across the globe. The program’s newly developed site allows students to upload their project ideas directly and encourages judges, mentors, and other interested parties to vote for their favorite ideas. Students have until Feb. 14 to submit their project proposals. Jasmine Hall has been in touch to reminds us about this published article below. Philosophy may get a bad rap for being an unmarketable college major, but in actuality, the lessons taught in philosophy classes can be applied to just about everything we do, day in and day out. From morality and ethics to free will and aesthetics, philosophical questions surround us in the creative, business, and scientific fields. Whether you need a reminder of the awesomeness of all things philosophy-related or just want to stretch your brain, check out these amazing TED talks. You’ll hear from a range of scientists, researchers, academics, and yes, even philosophers on issues that have been troubling the human mind for centuries. 1 Michael Sandel: What’s the right thing to do? Are there ever moral absolutes? That’s one of the questions political philosopher Michael Sandel addresses in this lecture, touching on some of the gray areas in our morality, and asking listeners like you to consider their own positions on right and wrong. Today I have Melanie Slaugh as guest blogger. Please be sure to check out her unique guest post. Guest posts are always welcome, please contact me. Going green can mean different things to different people. One thing we can all agree on, however, is that saving the environment should be a priority. One easy way for students to go green is to take their classes online. Not only do online classes not use as much paper as regular classes, the students also do not have to commute back and forth to school, reducing their carbon emissions. Also, the energy use from heating and cooling classrooms is drastically cut when students have the ability to learn from home. Online schools are healthier for the environment than traditional ones, but are you losing quality when you take classes online? With all the new online schools appearing, it is hard to tell which ones authentic and which ones are just diploma mills. Choosing an online school that is related to a brick-and-mortar school is usually a safe choice. But how does the curriculum compare? Arizona State University is one of the many schools that has both online and on campus curriculum. “Arizona State University (ASU or Arizona State) is a public research university located in the Phoenix Metropolitan Area of the State of Arizona. With an enrollment of 70,440 students in the Fall of 2010, it is the largest public university in the United States by enrollment. Founded in 1885 as the Tempe Normal School for the Arizona Territory, the school came under the control of the Arizona Board of Regents in 1945 and was renamed Arizona State College. A 1958 statewide ballot measure gave the university its present name. More than that, ASU offers more than 30 undergraduate and graduate degree programs through a completely online program, known as ASU Online. The degree programs you can take online have the same accreditation as the university's traditional on campus programs, and students can obtain most of the same degrees as those who attended courses in person. According to ASU Online’s website, more than 3,000 students are currently enrolled online. ASU Online is headquartered at ASU's Skysong campus in Scottsdale, Arizona. Not only is the curriculum identical but it is just as demanding and accurate as the on campus curriculum. New tools, such as online video conferencing and cooperative chat rooms permit teachers and students to relate in real time. Online students also have the benefit of being able to complete their work when they have the time, even in the middle of the night. Discussions are logged and saved so that no one misses out. In many ways, there is increased teacher-student interaction online. Additionally, online classes permit more students to enroll per class, thereby keeping tuition affordable. The advantages of online classes are easy to see and the curriculum is just as good as being taught in the on campus classrooms. As an increasing number of traditional universities offer entirely online programs, it is easy to see the advantages. If you are an environmentally conscious organized learner and want flexibility in your education, online is certainly the way to go. Melanie Slaugh is enthusiastic about the growing prospects and opportunities of various industries and writing articles on various consumer goods and services as a freelance writer. She writes extensively for internet service providers and also topics related to internet service providers in my area for presenting the consumers, the information they need to choose the right Internet package for them. She can be reached at her email. Chris Foresman writes, "On Thursday morning, Apple announced a series of related initiatives designed to modernize learning based around its iPad tablet. Apple is hoping to "reinvent textbooks" and change the way we learn with an updated iBooks 2 app, which works with interactive textbooks built with the iBooks Author desktop app, and an expansion of iTunes U that offers course materials and K-12 access. And according to several experts we spoke to, Apple's announcement today could do just that." Several educators were particularly bullish on the impact that Apple's move into the digital textbook market will have on both teaching and learning. 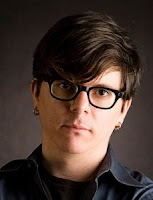 Assistant Professor of Arts, Media, and Design at Boston's Northeastern University Matthew Gray told Ars that iBooks 2 and iBooks Author will be a "fantastic" improvement over what's commonly used in universities now. "A pivotal year for students"
"Personally, I love this development" Gray said. "What was funny to me was the continuous emphasis on the word 'book.' But what Apple's new technology says to me, however, is 'syllabus.' This new kind of ebook acknowledges that we all can Google things, and therefore education needs something to bridge 'fixed' knowledge and 'fluid' delivery systems for knowledge. An e-book can use its unique referencing ability to link a far wider resource library to students." Abilene Christian Univeristy's director of educational innovation, Dr. William Rankin, also believes Apple's digital textbooks and iTunes U expansion will have a major transformative effect. "Teachers no longer have to have an IT department, digital infrastructure, or really even buy-in from their school," Rankin told Ars. "Apps, notes, syllabi, textbooks—they all integrate. 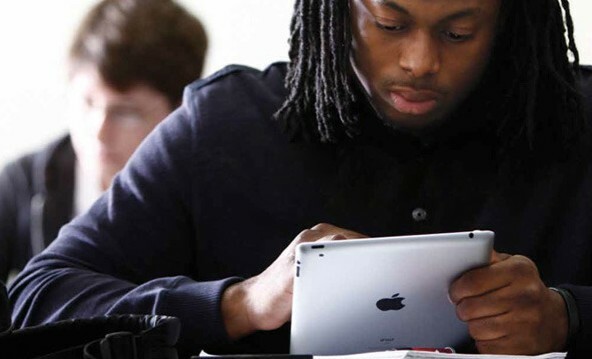 As long as I can get iPads for my students, I can do it all."